Another fantastic story to add to this series! 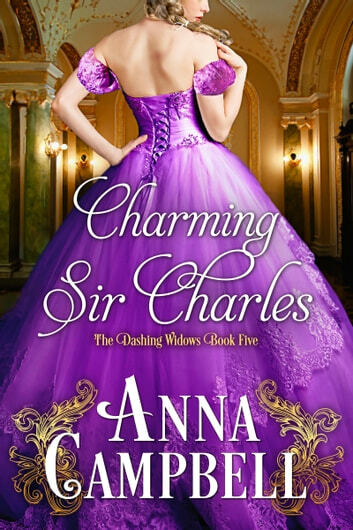 Charming Sir Charles is the fifth book in the Dashing Widows series by Anna Campbell. This series originally was of three young widows just out of mourning who decide to have some fun... fortunately for those of us who have loved this series, Anna Campbell decided to continue on with three more widows and a jilted suitor from one of the previous books. Sir Charles Kinglake was all that a girl could wish in a husband. Kind, sophisticated, rich and madly attractive as well. Unfortunately the woman of his dreams persists in thinking of him as a friend not a lover. Sally Cowan, Countess of Norwood married at seventeen to a man she’d quietly grown to despise. She believes her self too old for romance. So when she starts to have feelings for Sir Charles the man she believes is interested in her niece she panics! Charles was a wonderful hero and I really felt sorry for him that Sally refused to see and accept he was interested in her. Everyone could see he was smitten with Sally and that they were more suited for each other, and yet she struggled to see it. It was very obvious that Sally’s previous marriage had truly destroyed her confidence. One of my most favorite moments was when Morwenna stepped in and had a heart to heart with Sally to help her see clearly! I’m so happy these two wonderful people finally found their way and gained their HEA! Another fantastic story to add to this series. I am really enjoying all the “Dashing Widows”!